Houston, TX - Shareholders and shareholder representatives from around the globe holding legal proxies were refused entry to Chevron's annual meeting today. 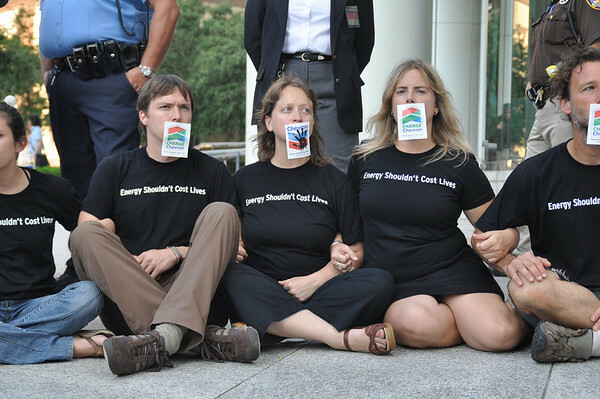 Five members of The True Cost of Chevron Network were subsequently arrested at the oil giants direction. Communities affected by Chevron attempted to enter its annual meeting while more "True Cost of Chevron" network supporters rallied outside. 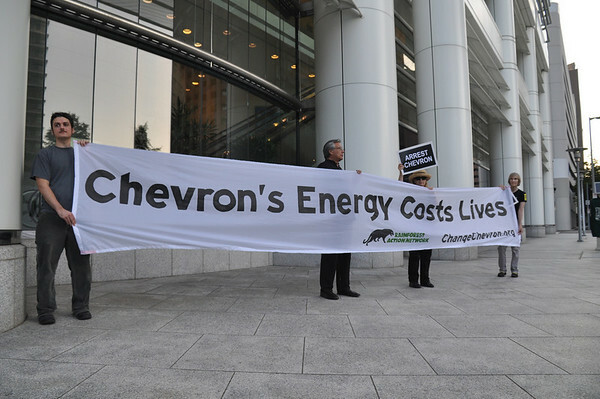 "Chevron CEO John Watson opened the annual shareholder meeting touting Chevron as a good neighbor and yet they locked the door for communities from Houston, Alaska, Canada, Burma, Nigeria, and Colombia. This is the way we have been treated at home and meeting them here was no different," explained Emem Okom, founder of the Kebetkuche Women Development and Resource Center of Nigeria. Of the 37 delegates from the Network with validly executed proxy statements, only seven were allowed to enter the meeting, contradicting Chevron's own policies and in potential violations of corporate governance laws.. Addressing the shareholders, Elias Isaac of Open Society Institute of Southern Africa, who has seen the results of Chevron's oil contaminations in Angola, said, "The disappearance of fish in Angola is a clear sign that Chevron is not compatible with the fishing business, despite John Watson's claims to the contrary during today's meeting." Josh Coates from the Wilderness Society of Australia was denied admission into the meeting had a message for CEO Watson: "Today I've been denied the opportunity to give a clear message to Chevron and the shareholders that the proposed liquid natural gas processing facility in the Kimberley region of northwest Australia comes with unacceptable environmental costs. The Kimberley region in the west of Australia is a last refuge for many species in the region, including humpback whales and the endangered Australian flatback turtle. Chevron is pushing an off-shore processing facility in the home of the humpback, while other options exist." Coates noted. Aileen Suzara, of the Filipino-American Coalition for Environmental Solidarity, was able to gain entrance into the meeting and addressed Chevron's operations in Manila, Phillipines, stating, "Over 80,000 residents in metro-Manila are threatened by Chevron's toxic fuel tanks, constant leaks, spills and emissions. Chevron refuses to relocate its depot despite the public outcry and a Philippine Supreme Court decision demanding closure." Outside the meeting, activist Naing Htoo of EarthRights International from Burma was denied the opportunity to address the Board of Directors. Had he gained entrance, he would have told the company directly that, "Chevron continues lying to their shareholders and the public about human rights abuses associated with the Yadana Project in Burma. Even this year the UN Special Rapporteur for Burma documented the connection between human rights abuses and Chevron's project. 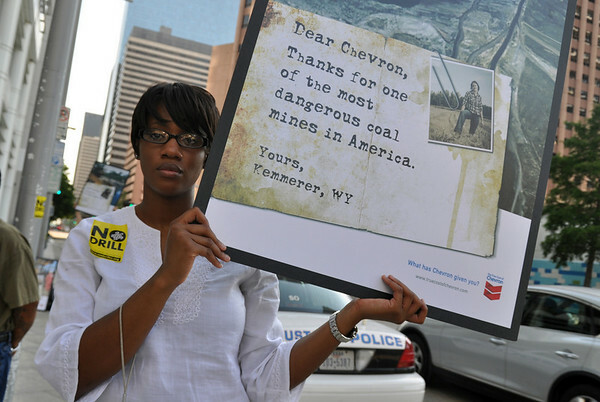 It's time for Chevron to take responsibility for the harms they cause." 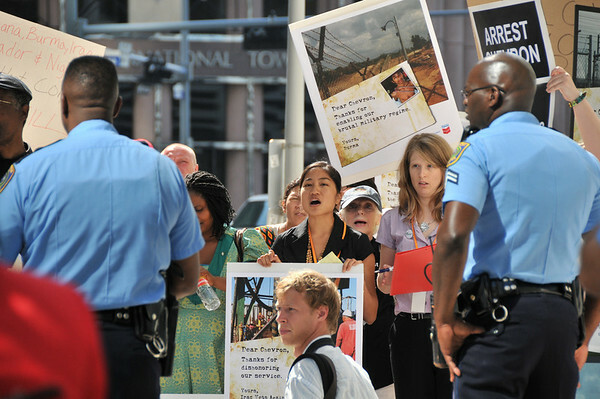 Of the five arrested, one was Antonia Juhasz, Lead Author of "The True Cost of Chevron: An Alternative Annual Report". 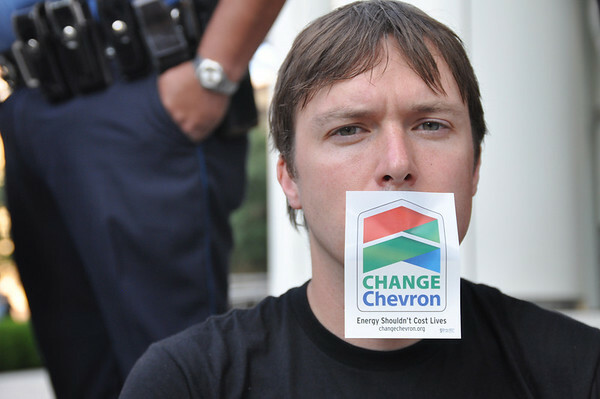 Juhasz was dragged from the meeting as shareholders and their proxies chanted, "Chevron Lies, People Die" and CEO John Watson abruptly ended the meeting. Others arrested included Reverend Ken Davis, a member Community for a Better Environment, from Richmond, California, Juan Parras of Houston-based Texas Environmental Justice Advocacy Solutions (TEJAS), and Mitchell Anderson and Han Shan of Amazon Watch; all arrested after being denied entrance. AmazonWatch works with Ecuadorian leaders like Guillermo Grefa, who was also denied entrance. Before his arrest, Reverend Davis stated "I represent an area where there is no beauty shop, groceries, or cleaners. Our industry is Chevron. My people breathe their contamination every day and are constantly sick. Our health is not for sale."